The Juniper-Tree is definitely NOT for children; it's one of the Grimm brothers' most graphically violent stories (and that's saying something). It is featured in our Fairy Tales Guide, recommended for ages 13 to adult. It is now long ago, quite two thousand years, since there was a rich man who had a beautiful and pious wife, and they loved each other dearly. They had, however, no children, though they wished for them very much, and the woman prayed for them day and night, but still they had none. Now there was a court-yard in front of their house in which was a juniper-tree, and one day in winter the woman was standing beneath it, paring herself an apple, and while she was paring herself the apple she cut her finger, and the blood fell on the snow. "Ah," said the woman, and sighed right heavily, and looked at the blood before her, and was most unhappy, "ah, if I had but a child as red as blood and as white as snow!" And while she thus spake, she became quite happy in her mind, and felt just as if that were going to happen. Then she went into the house and a month went by and the snow was gone, and two months, and then everything was green, and three months, and then all the flowers came out of the earth, and four months, and then all the trees in the wood grew thicker, and the green branches were all closely entwined, and the birds sang until the wood resounded and the blossoms fell from the trees, then the fifth month passed away and she stood under the juniper-tree, which smelt so sweetly that her heart leapt, and she fell on her knees and was beside herself with joy, and when the sixth month was over the fruit was large and fine, and then she was quite still, and the seventh month she snatched at the juniper-berries and ate them greedily, then she grew sick and sorrowful, then the eighth month passed, and she called her husband to her, and wept and said, "If I die then bury me beneath the juniper-tree." Then she was quite comforted and happy until the next month was over, and then she had a child as white as snow and as red as blood, and when she beheld it she was so delighted that she died. Then her husband buried her beneath the juniper-tree, and he began to weep sore; after some time he was more at ease, and though he still wept he could bear it, and after some time longer he took another wife. By the second wife he had a daughter, but the first wife's child was a little son, and he was as red as blood and as white as snow. When the woman looked at her daughter she loved her very much, but then she looked at the little boy and it seemed to cut her to the heart, for the thought came into her mind that he would always stand in her way, and she was for ever thinking how she could get all the fortune for her daughter, and the Evil One filled her mind with this till she was quite wroth with the little boy, and slapped him here and cuffed him there, until the unhappy child was in continual terror, for when he came out of school he had no peace in any place. One day the woman had gone upstairs to her room, and her little daughter went up too, and said, "Mother, give me an apple." "Yes, my child," said the woman, and gave her a fine apple out of the chest, but the chest had a great heavy lid with a great sharp iron lock. "Mother," said the little daughter, "is brother not to have one too?" This made the woman angry, but she said, "Yes, when he comes out of school." And when she saw from the window that he was coming, it was just as if the Devil entered into her, and she snatched at the apple and took it away again from her daughter, and said, "Thou shalt not have one before thy brother." Then she threw the apple into the chest, and shut it. Then the little boy came in at the door, and the Devil made her say to him kindly, "My son, wilt thou have an apple?" and she looked wickedly at him. "Mother," said the little boy, "how dreadful you look! Yes, give me an apple." Then it seemed to her as if she were forced to say to him, "Come with me," and she opened the lid of the chest and said, "Take out an apple for thyself," and while the little boy was stooping inside, the Devil prompted her, and crash! she shut the lid down, and his head flew off and fell among the red apples. Then she was overwhelmed with terror, and thought, "If I could but make them think that it was not done by me!" So she went upstairs to her room to her chest of drawers, and took a white handkerchief out of the top drawer, and set the head on the neck again, and folded the handkerchief so that nothing could be seen, and she set him on a chair in front of the door, and put the apple in his hand. After this Marlinchen came into the kitchen to her mother, who was standing by the fire with a pan of hot water before her which she was constantly stirring round. 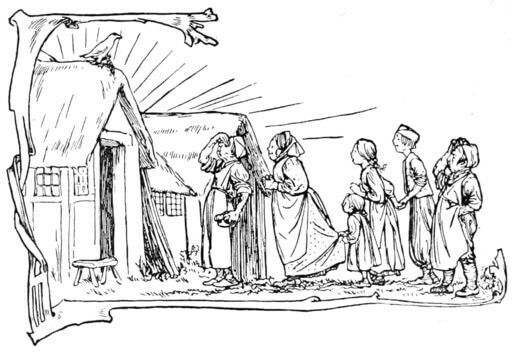 "Mother," said Marlinchen, "brother is sitting at the door, and he looks quite white and has an apple in his hand. I asked him to give me the apple, but he did not answer me, and I was quite frightened." "Go back to him," said her mother, "and if he will not answer thee, give him a box on the ear." So Marlinchen went to him and said, "Brother, give me the apple." But he was silent, and she gave him a box on the ear, on which his head fell down. Marlinchen was terrified, and began crying and screaming, and ran to her mother, and said, "Alas, mother, I have knocked my brother's head off!" and she wept and wept and could not be comforted. "Marlinchen," said the mother, "what hast thou done? but be quiet and let no one know it; it cannot be helped now, we will make him into black-puddings." Then the mother took the little boy and chopped him in pieces, put him into the pan and made him into black puddings; but Marlinchen stood by weeping and weeping, and all her tears fell into the pan and there was no need of any salt. Then the father came home, and sat down to dinner and said, "But where is my son?" And the mother served up a great dish of black-puddings, and Marlinchen wept and could not leave off. Then the father again said, "But where is my son?" "Ah," said the mother, "he has gone across the country to his mother's great uncle; he will stay there awhile." "And what is he going to do there? He did not even say good-bye to me." "Oh, he wanted to go, and asked me if he might stay six weeks, he is well taken care of there." "Ah," said the man, "I feel so unhappy lest all should not be right. He ought to have said good-bye to me." With that he began to eat and said, "Marlinchen, why art thou crying? Thy brother will certainly come back." Then he said, "Ah, wife, how delicious this food is, give me some more." And the more he ate the more he wanted to have, and he said, "Give me some more, you shall have none of it. It seems to me as if it were all mine." And he ate and ate and threw all the bones under the table, until he had finished the whole. But Marlinchen went away to her chest of drawers, and took her best silk handkerchief out of the bottom drawer, and got all the bones from beneath the table, and tied them up in her silk handkerchief, and carried them outside the door, weeping tears of blood. Then the juniper-tree began to stir itself, and the branches parted asunder, and moved together again, just as if some one was rejoicing and clapping his hands. At the same time a mist seemed to arise from the tree, and in the centre of this mist it burned like a fire, and a beautiful bird flew out of the fire singing magnificently, and he flew high up in the air, and when he was gone, the juniper-tree was just as it had been before, and the handkerchief with the bones was no longer there. Marlinchen, however, was as gay and happy as if her brother were still alive. And she went merrily into the house, and sat down to dinner and ate. Kywitt, kywitt, what a beautiful bird am I!" "My mother she killed me,"
"My father he ate me." Tied them in a silken handkerchief,"
"Kywitt, kywitt, what a beautiful bird am I!" Then the last stopped also, and heard the last words. "Bird," said he, "how beautifully thou singest! Let me, too, hear that. Sing that once more for me." "Nay," said the bird, "I will not sing twice for nothing. Give me the millstone, and then I will sing it again." "Yes," said he, "if it belonged to me only, thou shouldst have it." And when he had done singing, he spread his wings, and in his right claw he had the chain, and in his left the shoes, and round his neck the millstone, and he flew far away to his father's house. "My father he ate me,"
"Ah, mother," says the man, "that is a beautiful bird! He sings so splendidly, and the sun shines so warm, and there is a smell just like cinnamon." "My mother she killed me." "Would that I were a thousand feet beneath the earth so as not to hear that!" "Ah," said Marlinchen, "I too will go out and see if the bird will give me anything," and she went out. Then he threw down the shoes to her. Then she was light-hearted and joyous, and she put on the new red shoes, and danced and leaped into the house. "Ah," said she, "I was so sad when I went out and now I am so light-hearted; that is a splendid bird, he has given me a pair of red shoes!" "Well," said the woman, and sprang to her feet and her hair stood up like flames of fire, "I feel as if the world were coming to an end! I, too, will go out and see if my heart feels lighter." And as she went out at the door, crash! the bird threw down the millstone on her head, and she was entirely crushed by it. The father and Marlinchen heard what had happened and went out, and smoke, flames, and fire were rising from the place, and when that was over, there stood the little brother, and he took his father and Marlinchen by the hand, and all three were right glad, and they went into the house to dinner, and ate. Interested in other fairy tales for grown-ups? Visit our Fairy Tales Guide for recommendations. Add The Juniper-Tree to your own personal library.